I think that's only true if the bowel is not perforated. 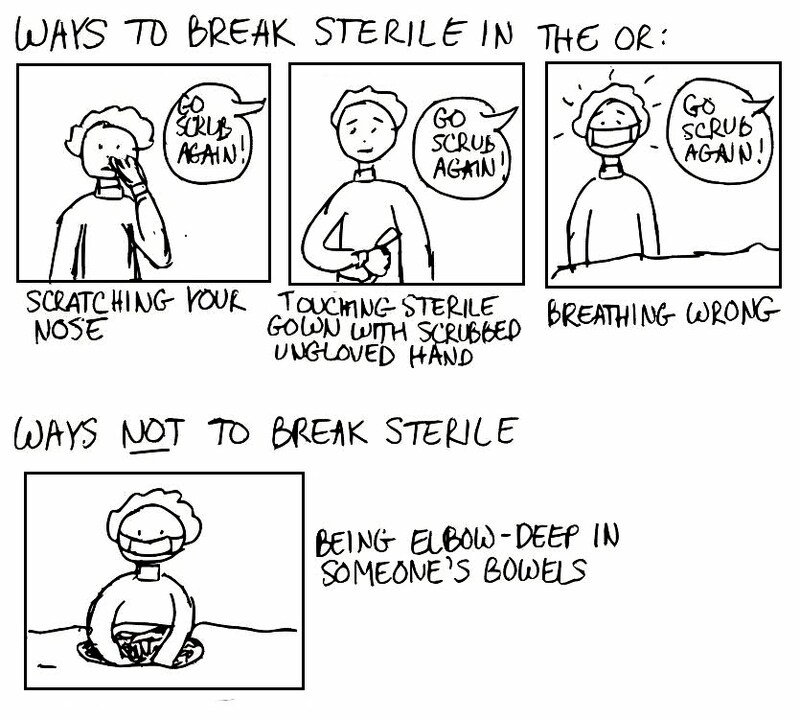 Im glad to hear that the rules of sterility are as arbitrary to you as it is to me. "No, you see, the gown is sterile at your neck, but as soon as it crosses your waist, it immediately becomes a fetid, cesspool of disease"
Not-house -- And remember, all attending surgeons are automatically sterile, even when they're not scrubbed and gowned. And don't raise your hands above shoulder height. Scrub again. Unless you're the attending attaching the light covers. Oh yeah. 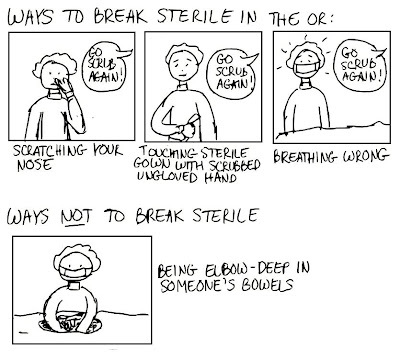 Sterile = good. No questions. Hahha. Also, germs are somehow incapable from spreading down your face onto your sterile front, or from advancing upwards in a similar fashion, even during a 10 hour surgery. Similarly, germs cannot possibly penetrate through or around the flimsy blue drape we place on the patient. One of the many reasons I will never do surgery. I work in a hospital lab in the UK. We cannot walk through the lab holding a drink because of the risk of an airborne germ floating around and landing on our cup of tea. But the staff room is in the room just off of the lab and the door is often wedged open. You can drink tea in there because the germs stop dead at the open doorway and don't float into the staff room to land on our cuppa.